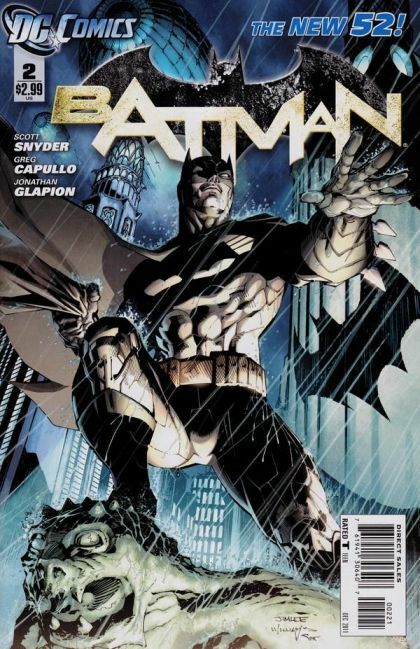 Written by SCOTT SNYDER Art and cover by GREG CAPULLO and JONATHAN GLAPION Cover by GREG CAPULLO Variant cover by JIM LEE 1:200 B&W variant cover by GREG CAPULLO On sale OCTOBER 19 ? 32 pg, FC, $2.99 US ? RATED T Retailers: This issue will ship with three covers. Please see the order form for more information. Bruce Wayne is back in the cowl, hunting a new and deadly killer in Gotham City - a killer with a vendetta against Bruce Wayne! But who is this mysterious killer in an owl skull mask? And is he the key to unlocking one of Gotham's oldest and most terrifying secrets? Be there for their first brutal encounter!